Ingenuity ConvertMe Swing-2-Seat is a remarkable swing that converts to a vibrating seat with our Easylock system. The SlimFold design folds flat for easy storage or travel so that you and baby can travel with ease. Baby will enjoy 8 soothing melodies and 3 nature sounds, plus 5 swing speeds, each with automatic timer settings of 30, 45, and 60 minutes. The pivoting toy bar features 1 plush toy and 2 additional slots for attaching more hanging toys to keep baby's view new and engaging. 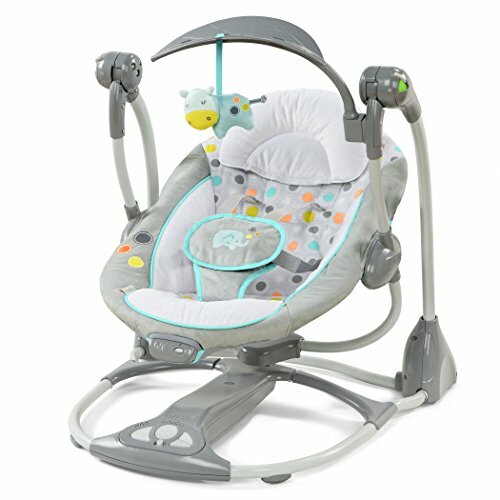 WhisperQuiet operation helps baby swing in virtual silence and our patented Hybridrive technology makes batteries last up to 3 times longer than traditional swings and bouncers. The seat pad and plush head support are machine-washable and keep baby cozy and comfortably supported. The tasteful styling of our Avondale Collection will complement your home decor - look for the entire Avondale collection of baby gear from Ingenuity! Ingenuity - Designed with parenthood in mind.